The Main Keys Are Much Small Than Adult Fingers And Compact:the main key size is 0.39 inch x 0.39 inch square,the space between keys is 0.09 inch. 3.Small size and light weight 95g,can be put in your pants pocket after roll up. The main keys size is 0.39 inch x 0.39 inch square,the space between keys is 0.09 inch. 5.Easy to carry on,very convenient. 6.Silent keyboard:Key in words silently. 9.Unique super energy saving mode makes the battery life 50% longer than similar products. 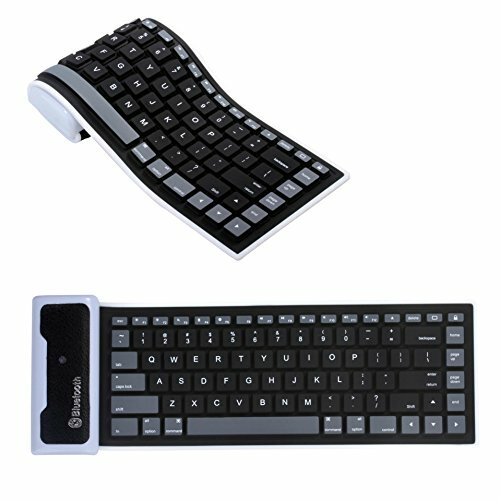 Roll up Flexible Mini Portable bluetooth keyboard convenient to take,can be put in your pants pocket after roll up.